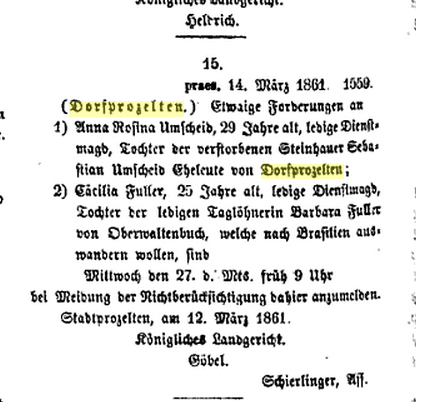 What news of the Dorfprozelten emigrants? My goal from searching the online German newspapers was, optimistically, to find more about my George Kunkel, but also to try to clarify the emigration of Franz Ignaz Zöller and his family, and potentially also his brother, Franz Joseph Xaver Zöller. In the way of things these are the very questions which remain unanswered after all the trawling through papers. However what I found most interesting of all was how much before the start of the voyage, the families left Dorfprozelten. Most of the late 1854/early 1855 emigrants travelled on two ships, the Peru and the Commodore Perry, with a few side-shunted onto the Boomerang. I don’t intend to go into those voyages here but you can learn more either from Jenny Paterson’s excellent articles[i] or my presentation to the 2003 Congress[ii] which focused on those who settled in Moreton Bay. In terms of specific Dorfprozelten families in Australia, you can refer to the articles I submitted to the QFHS Q150 project about those who arrived in Queensland pre-Separation in 1859 (available as a book or on CD)[iii]. Searching the newspapers for Stadtprozelten (the larger village just a couple of kilometres up the road) as well as Dorfprozelten was helpful as their departure notices often referred to that village. The train also left from there and if I’ve deciphered the abbreviations correctly the notices also say exactly when the emigrants were leaving from the Stadtprozelten station. The trains also carried emigrants from other nearby villages like Oberaltenbuch, some of whose families were tied in with the Dorfprozelten people by marriage or friendship. You can imagine the pall of sadness which would have filled the atmosphere with so many leaving at once. Würzburger Abendblatt 26 October 1854; Vincenz Käuflein and wife, Clara Günzer from Dorfprozelten and Joh Hock from Breitenbrunn leave on 28 October. They would travel on the Commodore Perry, leaving in January 1855. In many cases I’ve been able to find the notices published in the Aschaffenburger Zeitung (AZ) which notified the creditors that someone was about to leave. For some reason these seem to have been concentrated in that paper while the date and time of departure were advertised in the Würzburger Abendblatt. The single most noticeable factor about the newspaper articles is the early departure of the emigrants from their home town. I had imagined they would leave much closer to the sailing date of their ship but in fact most left months earlier than that. Aschaffenburger Zeitung 1 October 1854. They were leaving on 2 October and would not sail until January 1855. For example, the Peru was scheduled to sail from Hamburg around 16th December[iv] though it apparently left on 17 January[v]. 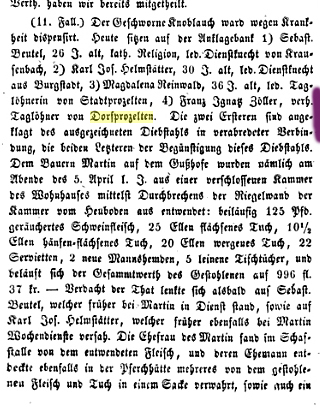 The newspaper notices indicate that the Dorfprozelten people who travelled on this ship actually left by train between 6 September and 10 October 1854. They didn’t arrive in Sydney until 23 May 1855 so they had been on the move for at least eight months! Small wonder they were in poor condition when they arrived in Australia. The Commodore Perry and Boomerang travellers didn’t fare much better. They left home by train between 2 October and 28 October and their ship left Liverpool on 11 January, and with a stop in Launceston, they arrived in Sydney on 26 April 1855. An overall journey of six months minimum. The Boomerang passengers (including Carl Diflo and family, and Joseph Zöller and family) were in much the same position. Each time I read of the German emigrants I am struck by the difference in how the Irish and British migrants were treated by comparison. Irrespective of the rules and regulations, it is evident they were not protected as well or treated as well in their overall journey. Achaffenburger Zeitung 1 September 1854: Aloys Joseph Neubeck. It’s apparent from the advertisements that some of the emigrants who were married by the time of arrival in Australia, were still single on departure. As they needed to be married in order to gain government assistance, it’s likely they married en route, either in their port of departure or in one of the cities along the way. Würzburger Abendblatt 7 October 1854 lists Käuflein, Löhr, Bilz, Kuhn, Krebs, Zöller and Seus. Andreas Diflo and Juliana Löhr are shown as married by the time they reach Australia. As are Ludovica Seus and Carl Wörner. Couples who fall into this category are: Eugen Nebauer and Caroline Umscheid; Clara Rosina Günzer and Johann Hock; Andrew Diflo and Juliana Löhr; Carl Wörner and Ludovica Seus. Others who married fellow emigrants soon after arrival were Georg Günzer and Hildagard Hock; and Franz Joseph Dümig and Cecilia Füller. In some cases the newspaper advertisement mentions the person was emigrating to Australia, in other cases nothing is mentioned. For a small group who left in 1861 including Eleanore Löhr, Anna Maria Umscheid, Franz Joseph Dümig (later Dimmock) and Cäcelie Füller (Cecilia later married Dümig), their notified destination was Brazil. What happened that they changed their minds and ended up in Australia? I found this change of destination particularly poignant in the case of Dümig and Füller because of their tragic story in Australia. Did those who were also listed in the same advertisement still go on to Brazil? Did Johann Philip Brand, his wife Sabina and children Alexander and Rosalia settle in Brazil or did they also re-route their emigration, perhaps to the USA. Was this the same man whose notice was in the paper in 1854? Did he change his mind but follow up later on when the children were older? It may seem self-evident to note that if the ships on which the emigrants travelled did not leave from Hamburg, their names won’t appear on the Hamburg shipping lists (also available via LDS microfilms). 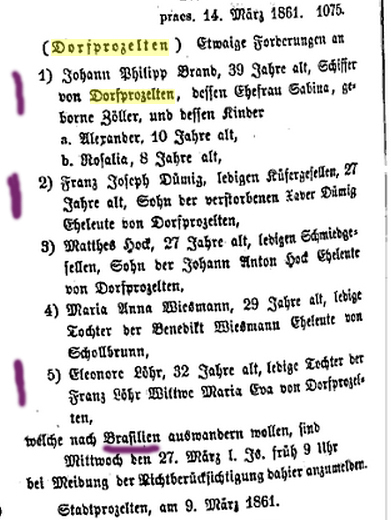 Thus some of the Dorfprozelten people are listed on the Kopittke indexes while others aren’t. The latter group are mainly those who left Liverpool on the Boomerang or the Commodore Perry. Those who were assisted by government subsidy will appear on the immigration records at the Australian end, but the single, unassisted, emigrants who sailed from another port won’t appear at either end of the migration experience. Perhaps this is why I can’t find my Georg Kunkel? And perhaps also Franz Joseph Xaver Zöller and daughter Mary Rosalie? This is where the newspapers are invaluable as they provide lists of names of single people who may have come to Australia (examples include Salome Seus and Gabriel Seus). These single emigrants may be related to others in the assisted emigrant category. Cecilia Füller and Anna Rosina Umscheid came to Australia rather than Brazil. Füller married Dümig soon after arriving in Australia. This advertisement provides age, occupation, parents’ names, and place of origin. Königlich-bayerisches Kreis-Amtsblatt 18 March 1861. 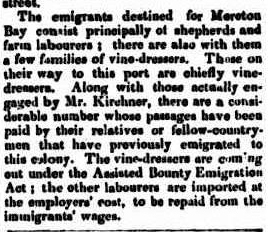 The additional benefit from the newspaper notices is that with the 1860s emigrants, the papers also state the emigrant’s age, sometimes their occupation, and also their parents’ names, especially invaluable if you have no other way of determining it, or linking them to the person you’ve found in Australia. In most cases the news notices indicate the person’s “place” however this can be deceptive as it sometimes appears to be where the person was then living and working. For example Michael Joseph Diflo is from Dorfprozelten, yet that is not a “name of the area” and with two other Diflos (Andrew and Carl Diflo) emigrating from Fechenbach that would be where I’d be looking for his birth. Michael Joseph Diflo appears in the papers and on the Kopittke indexes yet I have not found him on the unassisted passengers to Victoria or New South Wales, or in the death indexes. What happened to him I wonder? In some case the emigrant’s occupation is listed and that differs from what they state on their arrival to Australia. Hardly surprising since they had been recruited for their experience with the wine industry. In fact many had probably had some experience of this working as day labourers in Bavaria. The single people fared less well I think, because they were more often recruited to work as shepherds on the vast and distant areas of Queensland. It must have been tremendously confronting after life in a village and it certainly took its toll on some of the men and their families, the Dümig family being the most noticeable. And then there were those who appeared to be in the news generally and this is where I found Ignaz Zöller. Unfortunately with my German skills on life-support this will take some time to translate. Würzburger Abendblatt 12 Nov 1852: Ignaz Zöller. Or my discovery of my Kunkel ancestor’s liquidation issues for the Fass Guesthouse, which I wrote about last year. Using the digitised newspapers in time-consuming and often tedious. More importantly it’s also unpredictable. Lateral searching is critical and enthusiastic researchers may benefit from reading the paper, page by page, as with a microfilm. Given the print is in Fraktur type you might also find this webpage a helpful guide. Ultimately you’ll recognise the format of your ancestor’s name, making it easier to find that needle in the haystack. While the Australian colonies were generally happy to have the hard-working Germans as immigrants (at least until World War I), it can’t always be said that the migration experience was a happy one for the immigrants themselves, as their stories attest. Although they have left a strong legacy in Australia, I often wonder whether the first generation wished they’d stayed at home. [ii] They weren’t all Lutherans – A case study of a small group of German Catholics who emigrated to Australia from Dorfprozelten, Bavaria. Cass, P. Published in the Proceedings of the 11th Australasian Congress on Genealogy & Heraldry, Darwin, 2006. [iii] Queensland Founding Families, Queensland Family History Society CD. This is available in both CD and book. It includes a large number of stories submitted by P Cass on the Dorfprozelten Germans in Queensland pre-Separation in 1859. This entry was posted in Bavarian family history, Bavarian local history, Dorfprozelten, German migration, Kunkel, Migration history and tagged Brazil, Dümig, Gasthof zum goldenen Fass, Günzer, German Newspapers, Käuflein, Kuhn, Kunkel, Löhr, migration by cassmob. Bookmark the permalink. Thanks once again for coming up with another trove of information. From the article you posted from the Würzburger Abendblatt 12 Nov 1852, my g.g. grandfather, Franz Ignaz Zöller of Dorfprozelten, was charged with being an accessory to a burglary which Sebastian Beutel of Krausenbach, presumably a relative of Franz’ wife Catherine Beutel from the same town, was alleged to have committed, along with others. The theives had broken into Farmer Martin’s house via the ceiling under the hayloft. The accused had been working at the farm. The main items stolen were food, clothing, and table linen. This accords with the desperate economic situation in the area which was a major driver of the emigration. It is also one of the only sources with Franz’ full and correctly spelt name. And the theft of table linen along with the food shows style! As I haven’t been able to find the newspaper online yet, could you please also post the remainder of the article – the suspense about the outcome of the trial is hard to bear! Also, I tried emailing the Heimat Geschichtsverein Dorfprozelten to purchase copies of Georg Veh’s books, but no reply so far. Do you know a better way to contact them? hi John, Thanks for the translation -this is pretty much what I suspected in general terms though I couldn’t decipher the lot. I agree that it’s very likely that his name in combination with Beutel from Krausenbach makes the latter Franz Ignaz’s brother-in-law, though something to establish from the records one fine day. Like you say, times were desperate and opportunities grabbed -along with the table linen. I e-mailed Georg Veh georgveh [ at ] yahoo.de ( in german ) asking him to sell me a copy of “Dorfprozelten – ein Dorf im Wandel seiner 1000jährigen Geschichte Teil 2”, which he did for euro 33.90 including postage. Thanks John. I’ll be seeing Pauleen on Saturday for a Zeller reunion. Would you mind if she gave me your email address so I can get more details? John I am currently listing all descendants of Peter Zellers Line including Franz Ignaz thru to and including your grandmother Alma, would definitely be interested in the full translation of this article. I’ve been MIA just like you for a bit, but I’m back to visit! I’d always assumed that my German emigrants had travelled from their hometown to their ship via the Rhine, since that was just near their town. But I’ll have a look at the rail-line just in case!